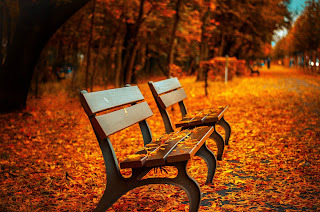 Although I've loved living in Southern California my whole life (especially the part of that where I moved to the beach), the one thing that I've always been envious of, is Fall. I mean a real Fall. Complete with turning leaves, crisp weather, and warm sweaters. If this year is anything like last year, it'll be Halloween and 85 degrees outside at 9 pm :). I mean just look at that photo! Who wouldn't want that? I guess it's true that we all think the grass is greener on the other side. When my friends on the East Coast are freezing during November, I'm complaining because its 55 degrees outside. Ah, the give and take of it all. I still try to bring a little bit of Fall to us, here by the beach. We put out Fall decorations, indulge in squash dishes (because YUM! ), and sometimes drink hot cocoa even though it's not quite cold enough. I've never been a big PSL person, but give me cocoa and the world is perfect. Is there anything that you love about Fall? Something you do every year that makes it official? Recommended to: Readers who enjoy stories that span the decades, with a heaping helping of unrequited romance. 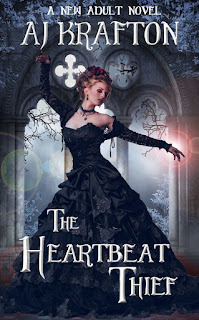 Haunted by a crushing fear of death, a young Victorian woman discovers the secret of eternal youth--she must surrender her life to attain it, and steal heartbeats to keep it. In 1860 Surrey, a young woman has only one occupation: to marry. Senza Fyne is beautiful, intelligent, and lacks neither wealth nor connections. Finding a husband shouldn't be difficult, not when she has her entire life before her. But it's not life that preoccupies her thoughts. It's death--and that shadowy spectre haunts her every step. When her mother arranges a courtship with another man, Senza is desperate for escape from a dull prescripted destiny. Impulsively, she takes Knell up on his offer. He casts a spell that frees her from the cruelty of time and the threat of death--but at a steep price. In order to maintain eternal youth, she must feed on the heartbeats of others. How far will Senza Fyne go to avoid Death? What would you do to cheat death? 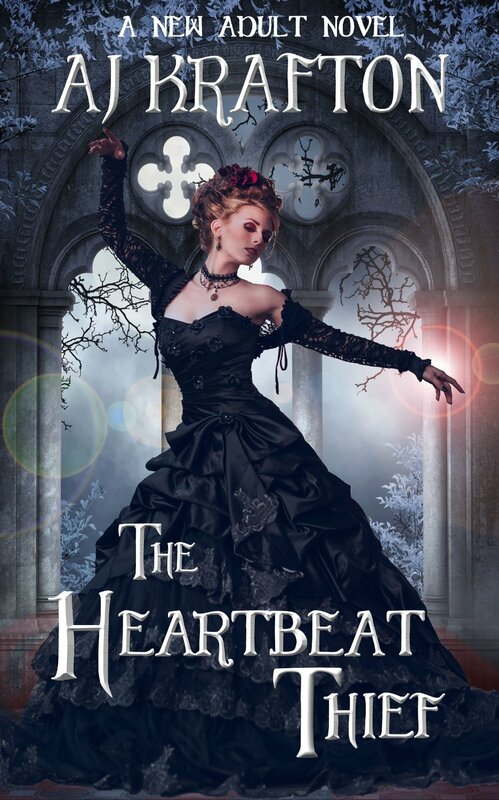 That's the question that lies at the very heart of The Heartbeat Thief. In fact, it's the very question that plagues Miss Senza Fyne, the protagonist of this story. When your whole life is your beauty, when you're pampered and primped, raised with the sole purpose of claiming a good husband, how do you face down time? Time, which will steal that beauty. Time, which will steal those closest to you. That deep, dark fear of the unknown is exactly what drives our protagonist, and it makes for a rather interesting story. I'll admit that Senza took a while to grow into a character I liked. I didn't fault her for her prim and proper demeanor, nor for the way she drank in the attention of others. It's simply how she was raised. No, what made it hard for me to like Senza was how deeply irrational her fear of death felt on the surface. I have firsthand knowledge of how hard it is to lose a loved one. It cuts deep, and isn't something that goes away. For Senza though, the loss of her loved one caused something that felt forced to me, at least at first. Suddenly she was terrified of dying. So much so, she put her faith in a gorgeous stranger that she had never even met. Does that sound wise? I think not. However, as the story progressed, things evened out. This story spans decades, and Senza slowly comes to experience much more than she ever expected in her long lifetime. I appreciated how AJ Krafton navigated history. Senza was put into situations that took her out of her comfort zone, and it was those times that I liked her the most. The more pain she went through, the more real she became. By the time I'd reached the ending, I actually understood her. I mentioned it above, but if beauty is all you've ever had, how do you let go of that and journey into the unknown? While this isn't a perfectly etched out story, the premise and the constant hopping through the decades keeps things fresh. I think you'll be pleasantly surprised at how much growing Senza does throughout this book. She comes out a brand new person, and a wonderful one at that, on the other end. Hand me characters that grow and learn, and you have my heart. A solid three stars to The Heartbeat Thief. Recommended to: Readers who enjoy deep stories about families, and specifically about sisters. 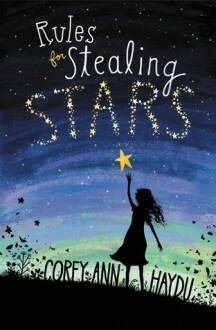 In the tradition of Sharon Creech and Wendy Mass, Corey Ann Haydu's sparkling middle grade debut is a sister story with a twist of magic, a swirl of darkness, and a whole lot of hope. Silly is used to feeling left out. Her three older sisters think she's too little for most things—especially when it comes to dealing with their mother's unpredictable moods and outbursts. This summer, Silly feels more alone than ever when her sisters keep whispering and sneaking away to their rooms together, returning with signs that something mysterious is afoot: sporting sunburned cheeks smudged with glitter and gold hair that looks like tinsel. When Silly is brought into her sisters' world, the truth is more exciting than she ever imagined. The sisters have discovered a magical place that gives them what they truly need: an escape from the complications of their home life. But there are dark truths there, too. Silly hopes the magic will be the secret to saving their family, but she's soon forced to wonder if it could tear them apart. Before you even ask, yes I did sob a bit during the reading of this book. It's nearly impossible to read a story like Rules for Stealing Stars and not have some deep feelings. This is a story about sisterhood. About family. About the fact that sometimes a family can seem like they're holding it together, but inside they're each falling apart. If you love magical realism and contemporary Middle Grade stories, you're going to fall in love with this book. I have a soft spot for stories about children. While most people see the pain that parents exhibit when a family is broken, they forget that the children feel it even more clearly. Looking at an an ailing parent, at the depression and anger that they're dealing with on a daily basis, is hard enough. Looking at that same parent through the eyes of a child is even harder. Imagine remembering what your family once was, and wondering if it will ever be that way ever again. Not knowing whether to love that person, or to pretend they don't exist to stop the hurt. Is it any wonder that I got emotional? I think not. Really, it was the sisters themselves that made this story for me. Eleanor, Astrid, Marla and Priscilla (Silly to her sisters), were such beautifully rendered characters. Each one dealing with this unstable part of their lives in such a different way. Eleanor choosing to run away from it. Astrid choosing to loose herself in her hobbies. Marla, trying so hard to change things and internalizing her fear. Finally, poor Silly and her inability to understand why her sisters didn't want to rally together. I watched as she did her best to figure out where she fit in this broken family, and I felt her hurt. So what of the magical realism? Well, it's definitely there. Corey Ann Haydu does a rather excellent job of bringing a bit of magic into the world of these girls. At first, I wasn't sure how I felt about this addition. I won't spoil, but it felt a little unbelievable. This is coming from a reader who opens herself to pretty much anything. However, the more I read the more I realized how perfectly the concept that Haydu was weaving into the story fit. Sometimes you don't know what you need until it's right in front of you. That's exactly what Silly and her sisters soon came to discover. Rules for Stealing Stars is sweet. It's sad. It's full of the kind of feelings that will make you want to curl up to stop the heartache. It's a gorgeous story, and one that I'm very glad that I read. Recommended to: Readers who enjoy plenty of history in their historical fiction. Deborah Harkness exploded onto the literary scene with her debut novel, A Discovery of Witches, Book One of the magical All Souls Trilogy and an international publishing phenomenon. The novel introduced Diana Bishop, Oxford scholar and reluctant witch, and the handsome geneticist and vampire Matthew Clairmont; together they found themselves at the center of a supernatural battle over an enchanted manuscript known as Ashmole 782. Now, picking up from A Discovery of Witches’ cliffhanger ending, Shadow of Night plunges Diana and Matthew into Elizabethan London, a world of spies, subterfuge, and a coterie of Matthew’s old friends, the mysterious School of Night that includes Christopher Marlowe and Walter Raleigh. Here, Diana must locate a witch to tutor her in magic, Matthew is forced to confront a past he thought he had put to rest, and the mystery of Ashmole 782 deepens. 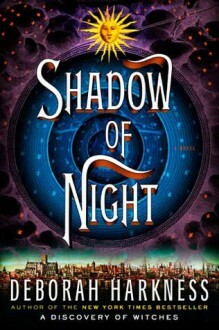 Deborah Harkness has crafted a gripping journey through a world of alchemy, time travel, and magical discoveries, delivering one of the most hotly anticipated novels of the season. Oh look, a review! I finished a book! Granted it was an audio book, and it took me over a month to finish, but I finished a book. On to the review. So despite a few rather dense portions of the first book, A Discovery of Witches ended up garnering 4 stars from me. I was drawn in by the wide cast of characters, and specifically by Diana's vibrant personality. Jennifer Ikeda's narration of that book stole my heart, and I couldn't wait to get to the second book. Which is why I was so surprised at how long it took me to make it through Shadow of Night. Same amazing narrator, yet it was much harder to sink into the story. This book takes place in the the past, Elizabethan London to be exact. I think that this was the first big nail in the coffin for me. It's not that I don't love this setting. I absolutely do! However the need for Diana to blend in completely squashed everything about her that I loved. Her fire was tampered. Her wit was under wraps. She was an obedient and terrified woman, and nothing more. Worse yet, the relationship between Matthew and Diana that I fell in love with in the first book suffered massively here. The tension between them, Matthew's tendency to act the part of dominant male, and the fact that they wouldn't communicate, all drove me mad. For the entire first half of this story, I was annoyed. Then, there was a light at the end of the tunnel. Without warning, things suddenly became much more interesting. The Diana that I fell in love with started to come to the surface again. She confronted Matthew, and things stopped being so sad. Suddenly there was magic in the world again. 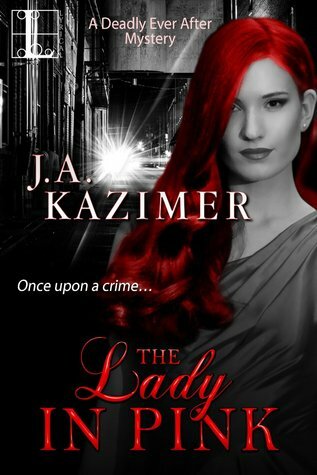 Things were vivid, characters were fascinating, and I couldn't stop reading. If only I had known that this was coming, I would have read much quicker. It's sad that the beginning bogged me down so much. Final verdict? This is definitely a book that suffers from middle book syndrome, in my eyes. It isn't bad, it's just extremely dense. Lots of events need to take place to make sure that things are set up for the future (or present from book one), and so there's not as much attention paid to many of the items I became attached to at the beginning of this series. Do I have high hopes for book three? Absolutely! The ending of this book was perfection, and I can't wait to see what happens next. So to slowly get back into the groove of blogging, I've decided to participate in some memes! They're a great way to get some conversation going, and plus I haven't really finished reading much lately. It's a travesty... I know. Told in Kvothe's own voice, this is the tale of the magically gifted young man who grows to be the most notorious wizard his world has ever seen. The intimate narrative of his childhood in a troupe of traveling players, his years spent as a near-feral orphan in a crime-ridden city, his daringly brazen yet successful bid to enter a legendary school of magic, and his life as a fugitive after the murder of a king form a gripping coming-of-age story unrivaled in recent literature. 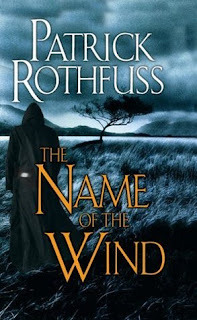 A high-action story written with a poet's hand, The Name of the Wind is a masterpiece that will transport readers into the body and mind of a wizard. I'm sad to say that I own this in both audio and in paperback. 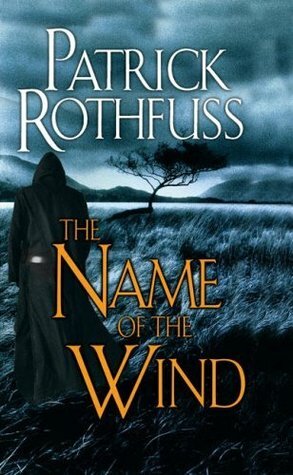 I've heard amazing things about Patrick Rothfuss, and this book comes highly recommended. I've just never gotten around to it. I want to be swept in an epic fantasy. I just haven't had time for it yet. I thought this meme was doubly appropriate today, since it is Wednesday after all. Ugh, that slump. You know, since March I've been trying to pull myself out of this reading/blogging slump and back into the full-force blogger that I usually am. Truth be told, I'm not winning at this. At all. Oh sure, I'll get a wave of excitement for a few days. Then terrible TV calls my name, or that video game looks tempting, or I just want a nap, and suddenly reading takes a back seat. I realized that my blog is 5 years old. Yup, April marked 5 straight years that I've been attacking you all with my manic bookish thoughts. Isn't that crazy? It's a huge commitment, and one that I absolutely love. Unfortunately right now it's just not taking center stage. I'm still reading, albeit slowly (and mostly comics/graphic novels). The next time I get a random bout of energy, I think I'll make some preset posts and reviews for y'all. I'm still here. I'm not ignoring you. You all rock! If you absolutely can't live without my updates, feel free to check out my BookLikes page! I'm generally a bit more motivated to post there. Hugs, love, and happy reading. If only my tea looked that elegant. Usually it's placed in my favorite mug that my husband painted for me at Color Me Mine. It's also usually accompanied by a muffin or a breakfast sandwich! Tea is my favorite breakfast drink. 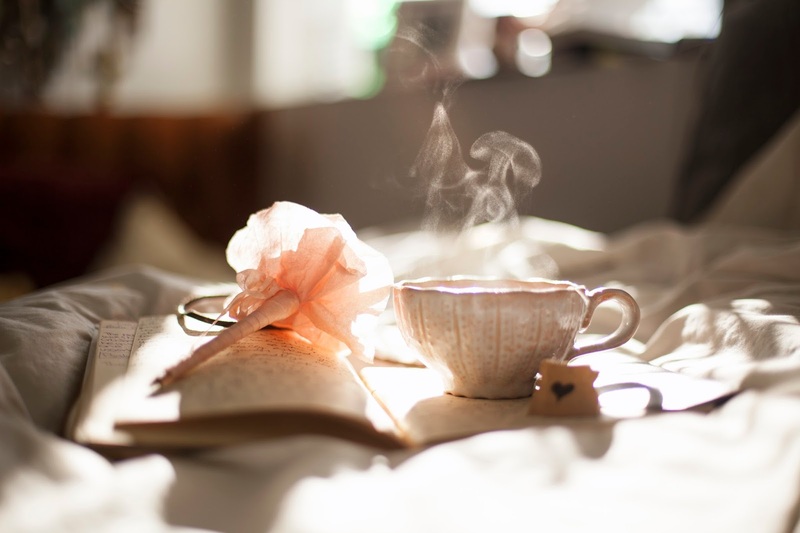 Which brings me to the joyful experience that has been learning about tea! I used to be a coffee addict. Working at a job that required a 3 hour round-trip commute made it so that I felt like I was a zombie without my coffee. It got to the point where I'd get headaches without my caffeine. I didn't like that one bit, so I set off to do something nice for my body. I slowly weaned myself off of those coffee beans and now I'm all about tea. I'm amazed by all the flavors out there, and loose leaf has become my new favorite. It smells great, it brews great, and it's heavenly. I could never drink coffee black, but tea? Tea I can drink with nothing else in it. So good! That beautiful picture up top is the Pomegranate Escape tea from Tarm's Tea. 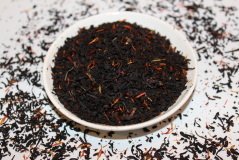 It's my current obsession, along with my go-to favorite of Twinnings Earl Grey Tea. Hot tea, cold tea, doesn't matter. It's all amazing. I'm hooked. Do you have any favorite blends out there that you'd like to share? Recommended to: Readers who enjoy stories with a slow burn, and a twist at the end. Victorian London: For five years, Charlotte (Charlie) Holloway has lived as a boy in the slums. But when one theft too many gets her arrested, her only means of escape lies with a dead man. Charlie hasn't raised a spirit since she first discovered she could do so five years ago. That time, her father banished her. This time, she brings even more trouble upon herself. 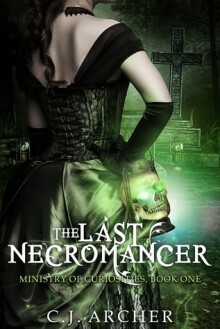 Lincoln Fitzroy is the mysterious head of a secret organization on the trail of a madman who needs a necromancer to control his newly "made" creatures. There was only one known necromancer in the world - Charlotte - but now there appears to be two. Lincoln captures the willful Charlie in the hopes the boy will lead him to Charlotte. But what happens when he discovers the boy is in fact the young woman he's been searching for all along? And will she agree to work for the man who held her against her will, and for an organization she doesn't trust? Because Lincoln and his ministry might be just as dangerous as the madman they're hunting. Pardon me, just a moment, while I flail in excitement over this cover! I'll fully admit, that was the first thing that drew me to The Last Necromancer. Of course, once I found out it was set in Victorian London I was hooked. Still, it's hard to deny that this book has some gorgeous wrappings. I can assure it, it's as pretty inside as it is out. If you're on the fence about this book, get off of that fence and go buy it. It's well worth your time. Charlotte, or Charlie as she prefers to be called, had my attention and admiration from the very first page. To say that her life is hard would most definitely be an understatement. I was given a main character whose entire life was centered around survival. A girl, posing as a boy, to keep her secrets hidden and keep herself alive. Charlie intrigued me. Her gruff demeanor, her razor sharp wit, all of it made for a character that I simply couldn't ignore. Even before any other characters were revealed, I was hooked. Charlie made sure of that. Oh, and the story that she is wrapped up in just sealed the deal. I was thrown into a world of mystery and magic. A place where a secret society is needed to keep things swept under the rug. Who wouldn't be interested? Any time that a secret society is involved, you know something good is coming. I followed along with Charlie, angry when she was angry, sad when she was sad, until finally her fate came into focus. I'll admit that this story is a slow burn. There's not too much action, but rather a lot of focus on the character build up and story line. I wasn't upset in the least though. When the villain finally made himself known, that's when I knew this series would be on my reading list until further notice. Brilliant! Am I being vague? Yes, I most certainly am. The Last Necromancer is a story that is much too easy to spoil, and I'd rather you go into it knowing as little as possible. Who is the mysterious villain? You'll have to discover that for yourself. I can assure you that it's well worth your time. I can't wait for more! 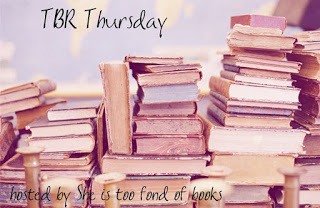 I hope so, because today's spotlight is on a very action-packed series that already had two gorgeous books out! Today it's all about Tracy Lawson, Counteract and Resist. In Counteract, Book One of The Resistance Series, the Office of Civilian Safety and Defense (OCSD) has guarded the public against the rampant threat of terrorism for the last fifteen years with the full backing of the US government. Their carefully crafted list of Civilian Restrictions means no concerts or sporting events, no travel, no social media, no cash transactions, and no driver's licenses for eighteen-year-olds Tommy and Careen. The OCSD has even outlawed grocery stores, all in the name of safety. Now, there's a new threat-airborne chemical weapons that could be activated at any time. But the OCSD has an antidote: just three drops a day is all it takes to stay safe. It's a small price to pay for safety. Or is it? Book Two, Resist, picks up this fast-paced dystopian series with the resistance forming against injustice. After their plan to rescue a group of dissenters imprisoned by the OCSD spins out of control, Tommy and Careen are on the run, dodging the quadrant marshals in a headlong dash for the remote mountain headquarters of the Resistance. Their budding relationship is tested when an attempt to spark a revolution goes awry, and the pair move toward an inevitable confrontation with the forces that terrorize the nation. Will their differing viewpoints drive a wedge between them? And where does love fit in when you’re trying to overthrow the government? I'm actually in the process of reading Counteract, so I can tell you first hand that it's fabulous. I love the premise, and it's scary how hard it hits home. After all, don't we generally follow blindly along with anything that is claimed to be good for our well-being? Scary stuff, that trust. 1. What was the inspiration behind The Resistance Series? I was mentoring a friend of my daughter’s when the initial idea for Counteract came about. Chase is a pretty sharp guy and an excellent writer—and when he was in high school I had a lot of fun working with him and editing some of his short stories. We had finished working on a story about baseball, a broken nose, and a broken heart, and were ready to start something new, when he suggested we write scenes in response to the prompt: “What if everyone were on LSD and all thoughts were communal?” It was certainly thought provoking! Chase created the characters Tommy and Eduardo, I created Careen, and right away, we knew we were onto something. Obviously, the story morphed and changed a lot before it became the finished version of Counteract—but that was how it all began. 2. Did you always plan to write another book in the series? 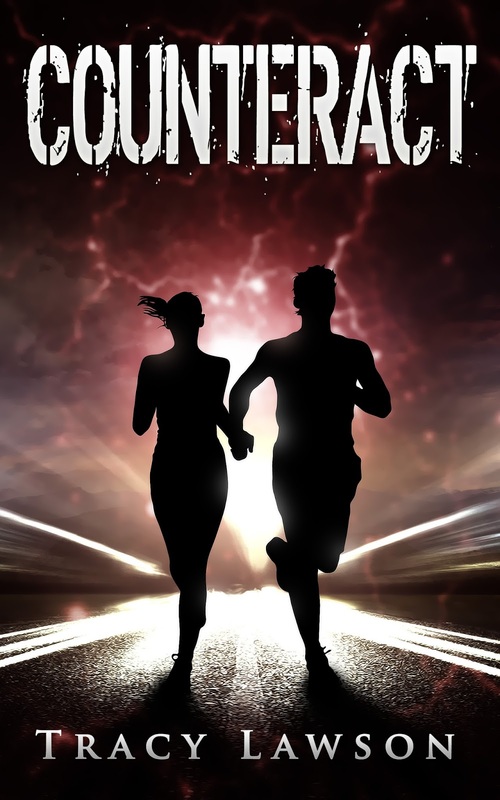 I let my husband read the first draft of Counteract when I was about a third of the way through the original outline. He was enthusiastic and supportive and suggested developing a story line that could be carried forward if I chose to make Counteract the first in a series. I liked the idea of doing more than one book about Tommy and Careen, and as I wrote the rest of the first draft, I pinpointed elements of the story I’d need to develop and expand to pave the way for a series. 3. How do the characters of Tommy and Careen develop in Resist? Tommy and Careen are law-abiding citizens until they accidentally discover that the Office of Civilian Safety and Defense lied about the terrorist attack and why it mandated the use of the Counteractive System of Defense drug. They go from being accepting and compliant to impulsively joining a rebel group that’s working to overthrow the oppressive government agency, without having a chance to think about what they’re doing and why. They’ve only known each other for a week, and their relationship has progressed far too quickly—they became a team, then a couple, without really getting to know each other, and soon they realize they don’t have much in common. Tommy’s all for the physical aspects of revolution, and is eager to learn about guns and explosives. Careen finds kindred spirits among the older leaders of the group, who are committed to sway the public’s allegiance away from the OCSD by waging a war of information. Her pacifistic approach clashes with his need to prove himself on the field of battle, and further complicates their partnership. 4. What do you enjoy about this series that cannot be found in any of your other books? The Resistance Series is my first published fiction. My other book, Fips, Bots, Doggeries, and More, is based on a journal kept by my great-great-great grandfather during his family’s 1838 horse and wagon trip from Cincinnati to New York City. I did a ton of research before writing that book, and amassed two filing cabinet drawers full of information related to the 22-page journal! During the publication process, I nearly went crazy double-checking all my facts and citations, and by the time the book went to print, I never wanted to see another footnote. Fiction? Yes, please! Now that I’ve had a little break from footnotes, I’m enjoying writing another nonfiction history book. I’m planning to merge my two favorite genres and write some YA historical fiction sometime after I finish the Resistance Series. 5. The main characters in The Resistance Series are Tommy and Careen. Where did you find your inspiration for them? My characters are a little bit of me, and little bits of people around me, but as I spend time with them in the context of the story, they become less like people in the real world; I don’t stop developing them until they are individuals: unique and unlike anyone else. Chase created Tommy, and at first I wasn’t as close to him as I was Careen. That changed as I wrote more scenes for Tommy—especially the scene when he and Careen meet. His reactions and his choices came from inside me; before long, he was unique and independent of any outside influence. 6. How does the Office of Civilian Safety and Defense (OCSD) differ from other dystopian governments in young adult series like The Hunger Games and Divergent? In the Resistance Series, there has been no rebellion, no cataclysmic event. The dystopian world in which they live has been created by fear, engineered by an enemy masquerading as a protector. The Office of Civilian Safety and Defense was created to protect against the rampant terrorism that has affected the nation for the better part of the twenty-first century. Little by little, the OCSD usurped power from the traditional three branches of the US government. The OCSD’s long list of Civilian Restrictions was designed to maximize safety and security. Most people don’t consider themselves oppressed or fettered by their lack of freedom. Teenagers like Tommy and Careen don’t know things were ever different. They can’t remember a time when teenagers learned how to drive and went on dates to malls and movie theaters. 7. What elements test the relationship between Tommy and Careen in Resist? Tommy and Careen had only each other to rely on in Counteract, and their relationship progressed quickly—perhaps a little too quickly. Now they’ve joined the Resistance, and they’re part of a community for the first time. They have a hard time adjusting to the constant scrutiny, and Tommy laments about how their relationship seemed a lot less complicated when they were alone. Their philosophical differences about how to fight the OCSD drive a wedge between them, and interpersonal rivalries and jealousy test their budding relationship. 8. What do you hope readers take away from this book? First and foremost, I want readers enjoy the story! I hope they relate to Tommy and Careen, and look forward to reading the next installment in the series. Books for young adults often reflect the reader’s need to question authority and rebel against the rules set down by older generations; the Resistance Series looks at what can happen when people surrender our civil liberties in exchange for the promise of safety and security. I hope readers understand that protagonists in dystopian books are often branded as outcasts or rebels because they question the restrictive rules of their societies—and that individuals who change the world rarely do so by going along with the herd. 9. What kind of research did you do for the series? Please don’t call the police if you see what’s in my browser history! I’ve Googled the effects of various controlled substances, different types of explosives, and interrogation techniques. 10. What made you want to write books for young readers? I love reading YA, and I taught dance classes for twenty years before I got serious about writing. I spent a lot of time around my students, my daughter, and her friends, so it seemed natural to write for a teen audience. 11. How long did it take you to write Resist? I wrote Resist in a little over a year. 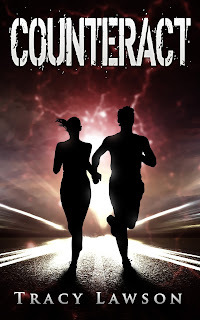 It went a lot faster than Counteract (which took almost three years) because I knew the characters well and had planned ways to continue the story into the second book. 12. Do you have any interesting writing quirks? I like to write with pen and paper—preferably outside. I sit quietly until one of the characters starts to speak, and then I write down what they say. Some days I’ll scribble for pages and pages, and when I look at the clock I’ll be surprised how much time has flown by! I usually let those pages sit for at least a few hours, sometimes a few days, before I transcribe them into the computer, and that’s where the scenes really begin to take shape. As far as writing snacks go, I’m partial to sunflower seeds and Diet Dr Pepper! My family has been very supportive. My husband knows how to urge me on when I get discouraged, and my daughter says I’m a better choreographer now that I’ve become an author. I guess writing helped me refine how to advance a story through dance. I haven’t shared much about what happens in Resist with my family. My five teenaged nieces can’t wait to read it, and I can’t wait to hear what they think! 14. Tell us where we can find your book and more information about you. My books are available on Amazon.com in paperback and Kindle, and on Barnes & Noble’s online store. If you live near Columbus, Ohio, you can buy signed copies of my books at three independent stores: The Book Loft of German Village, Mary B’s, and Urban Emporium. 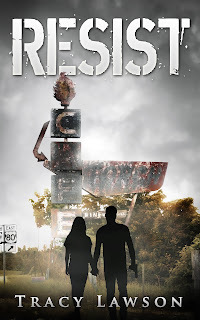 You can get the behind-the-scenes scoop on all things Resistance Series, see book trailers, and check out my blog at http://counteractbook.com. 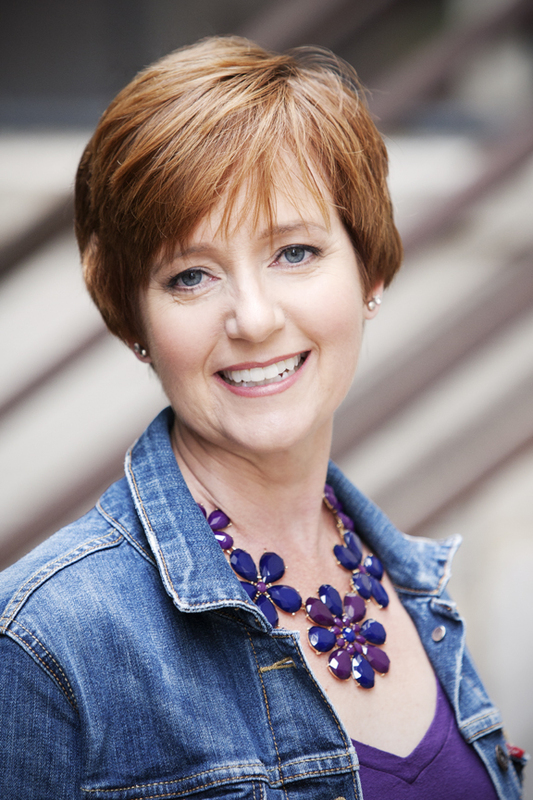 You can also find me on Twitter @TracySLawson and on Instagram as TracyLawsonAuthor. Yeah, it's been pretty quiet around here lately. I'm sure you've all noticed. In case you wanted to keep up with all things Jessica and Tina, here's a little bit about where we've been. Jessica is proud to announce that, after working her booty off for an entire month, and neglecting pretty much everything for the sake of work, she was hired full time at her job! Now things have calmed down, and she's trying her best to figure out how to deal with having free time again. Oh, and playing catch-up on all the the things she didn't do. Like blogging. Tina had her baby! (insert cheer here) She's a healthy, adorable little girl. I'll let her tell you more when she's ready, but suffice it to say that she's very busy being a new mommy! There's nothing more rewarding, and more exhausting/time consuming, than taking care of a new baby. I'm sure excited for her, and wish her all the best! So yes, we've both been busy. Also, yes, I did talk about myself in third person. Don't judge me. I'm determined to make September a little more busy in terms of posting, but bear with me if it's a slow start! I'm relishing the fact that I even have time to read again :).